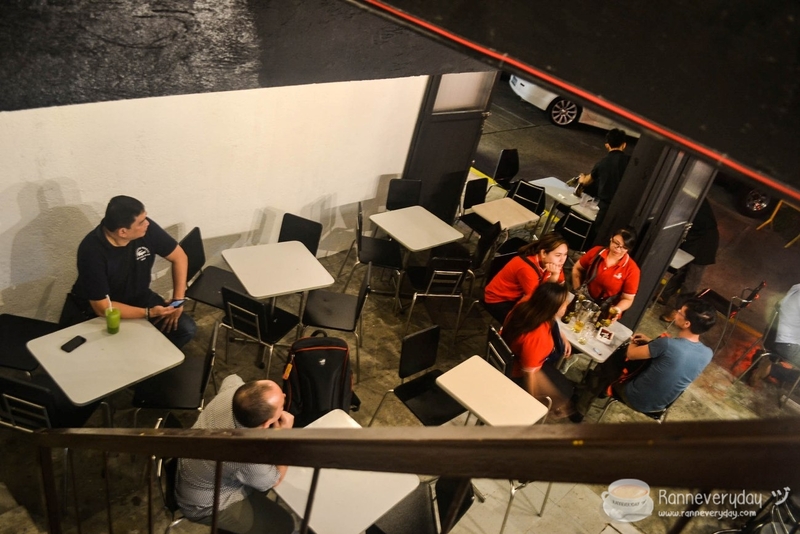 Awesome friends plus sumptuous food plus some cocktails and beer makes a perfect night jamming to enjoy. If you are looking for a place to spend for a beer night with friends, Habanero Kitchen.Bar is a place to enjoy as they serve cocktails, beers, and most of all - they have a very unique blend of food which is surely a must-try! Habanero Kitchen.Bar is located at Cubao Expo in Quezon City. 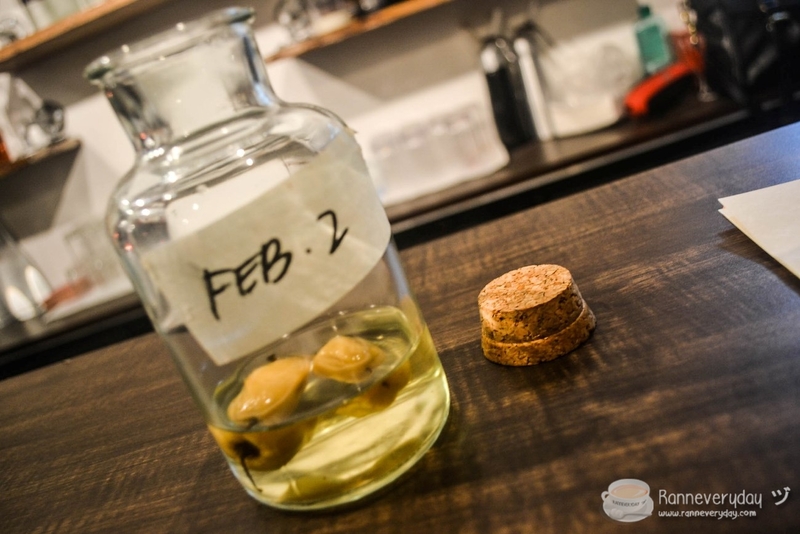 Currently on its second week after they open to the public, Habanero Kitchen.Bar offers beverages and dishes with a twist - adding their very own Habanero Vodka in their dishes. 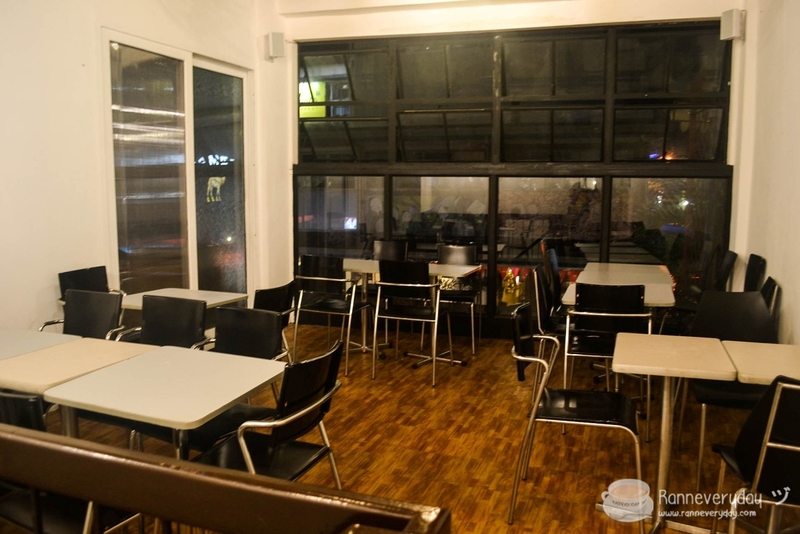 It is a two-storey restobar with a very cozy and friendly ambiance. 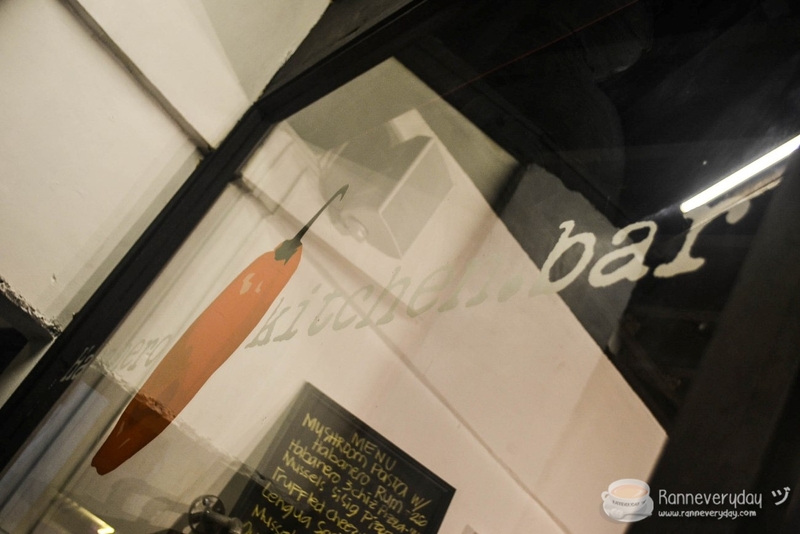 What makes Habanero Kitchen.Bar different from other restaurants/bars around the area? 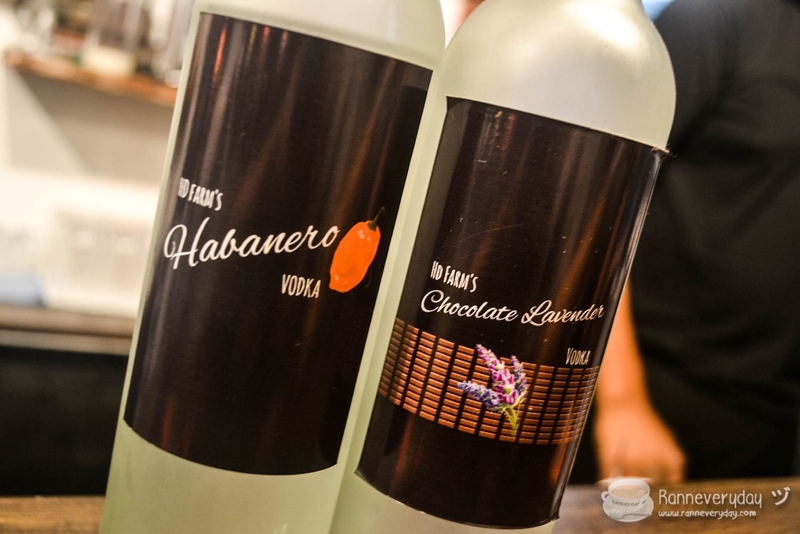 Their very own Habanero Vodka, which they blend and store is one of the things that made them unique. The aroma and the taste of the vodka itself is really good but it actually have a high percentage of alcohol in it - which you won't notice because of its very unique taste. 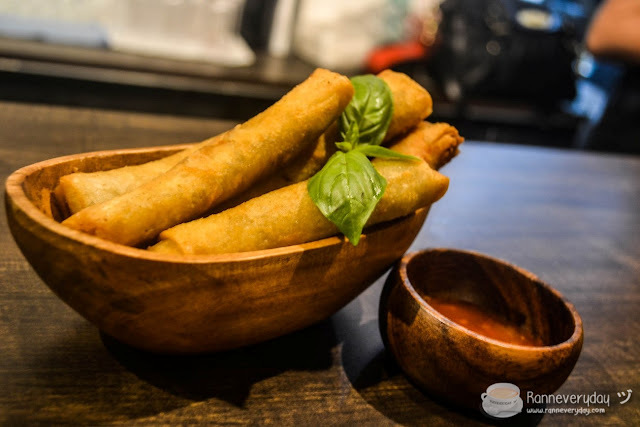 Spring Roll/Lumpiang Lengua - It is not your regular Lumpia dish. Their Lumpiang Lengua is a very crispy appetizer that you should try. It is served with their own blend of sauce that gives a kick of flavor to the dish. 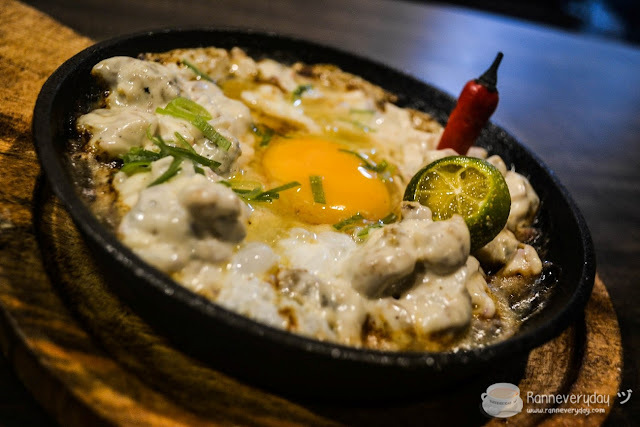 Oyster Sisig - I am not a fan of any oyster dishes but this Oyster Sisig makes me almost empty the sizzling plate literally! The oyster is very crispy plus the flavor blends well with the whole dish with a kick of spiciness in it. This dish is their best-seller and indeed a perfect pulutan! Sisig Carbonara (sampler size only, not the actual serving). 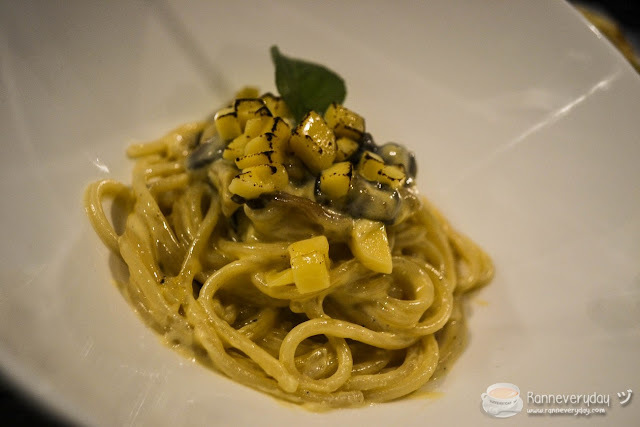 Mushroom Pasta with Habanero Rum - I really like their blend of this pasta dish because everything in it - especially the sauce - has not too much strong flavor in it plus the Hanabero Rum added a distinct flavor with the dish. If you crave for some pasta, be sure to give this dish a try! Pizza - They serve their thin crust pizza with their Hanabero Sauce blend for it. If you add the sauce with the pizza, it does make the flavor change. 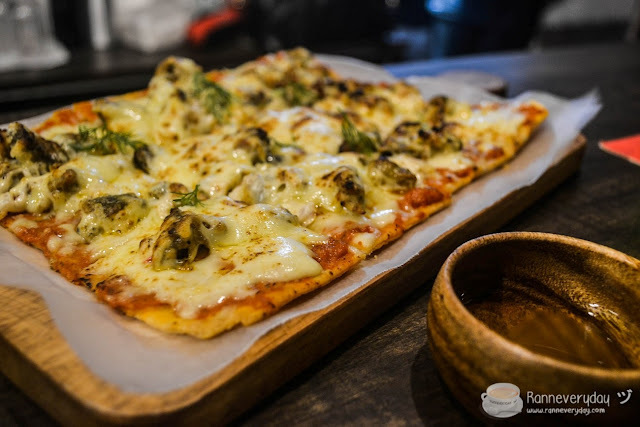 I really like their Mussels Sisig Pizza because of the different flavor associated with the pizza itself. 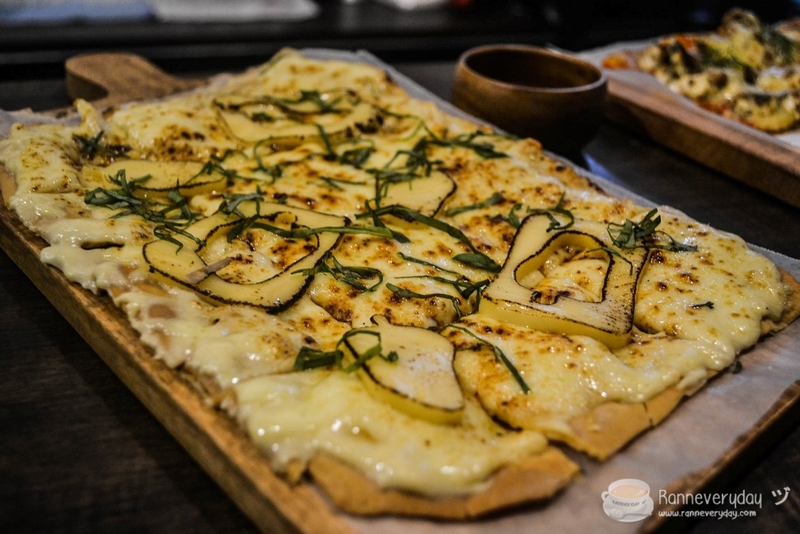 But if you like cheese, cheese and more cheese, be sure to try their 3-Cheese Pizza, with a combination of Mozzarella, Parmesan and Cheddar Cheese in a thin-crust pizza. Mojito - Served in a regular-size glass, their mojito drinks were absolutely full of flavor unlike other mojito drinks I tried (which is like I am only drinking a water with only a hint of flavor). 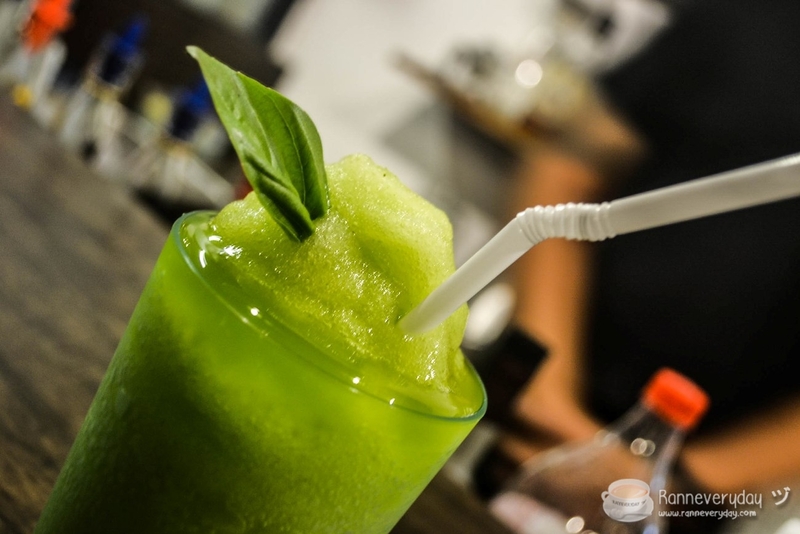 I tried their Cilantro Frozen Mojito and Basil Frozen Mojito. I prefer the Basil Mojito for myself. 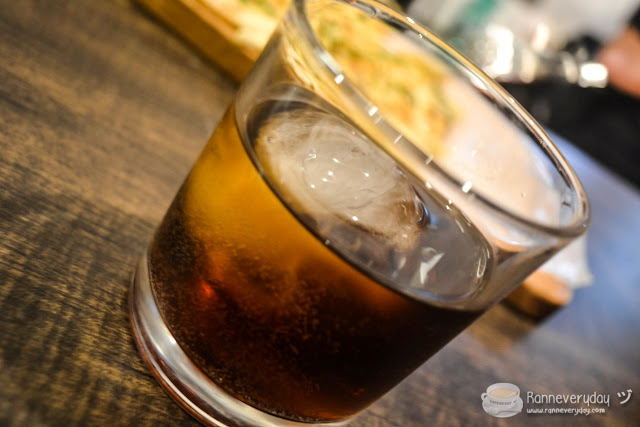 Smoked Rum Coke - They turn the ordinary rum coke into one of the best drink I've tried so far. I really like the flavor of this smoked rum coke as it like it was aged in Oak Barrels. 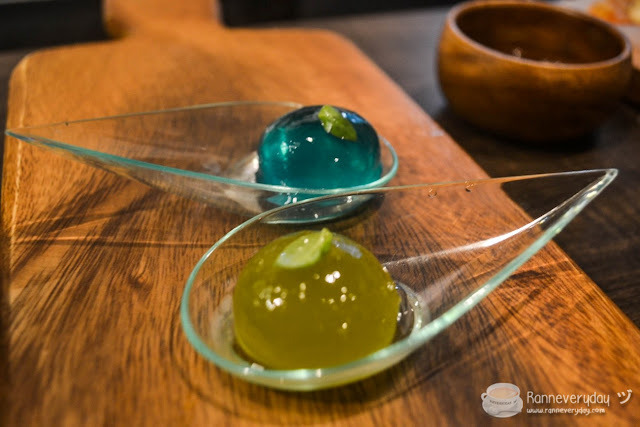 The taste is somewhat sweet and exquisite at the same time. X Bomb 5 Bursting Shots - Literally a bomb that explodes in your mouth! 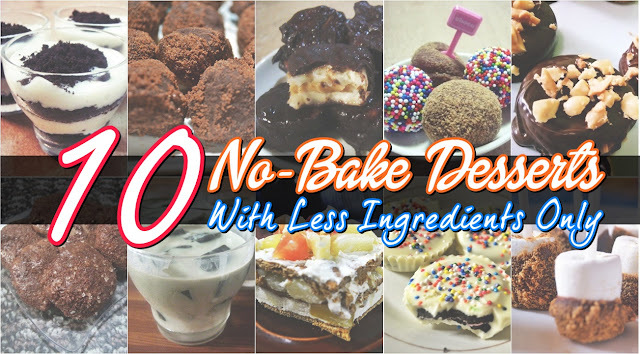 It is like a soft gel candy and you need to eat the whole thing and bam! The liquid will explode to your mouth. 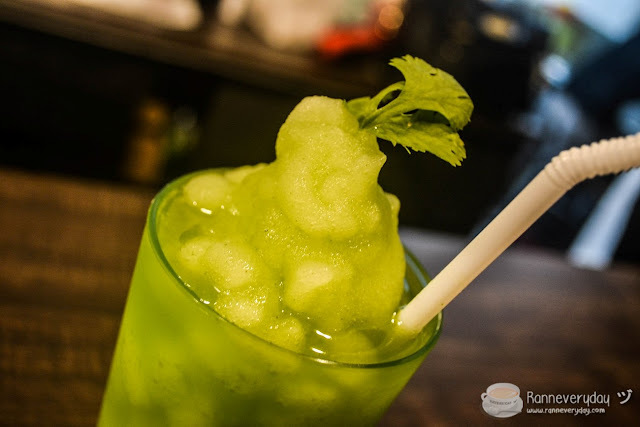 I am feeling a bit tipsy already but after I tried their Mojito X-Bomb, my dizziness were gone because of the refreshing flavor and the sudden burst in your mouth. If you are here at Habanero Kitchen.Bar, be sure to try this X Bomb shots! 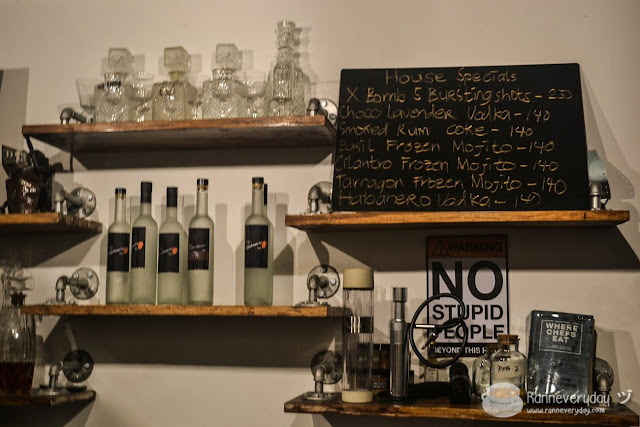 If you like to try their special vodka, you can also buy a bottle of their Habanero Vodka for around Php 699.00 and their Chocolate Lavander Vodka for around Php 599.00 per bottle. I have discovered another place to visit more often especially at night! Habanero Kitchen.Bar is definitely a must-try place as they offer drinks and delicious food with affordable prices. 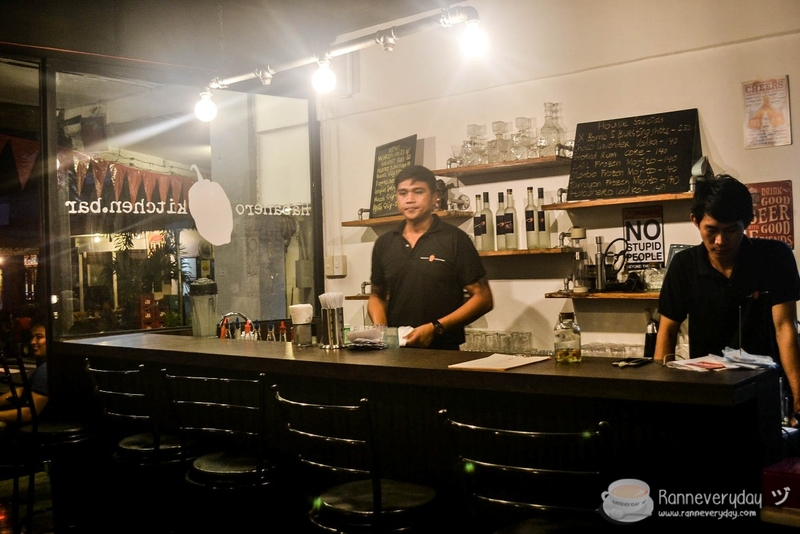 Bring your friends and spend some happy hour together here at Habanero Kitchen.Bar! 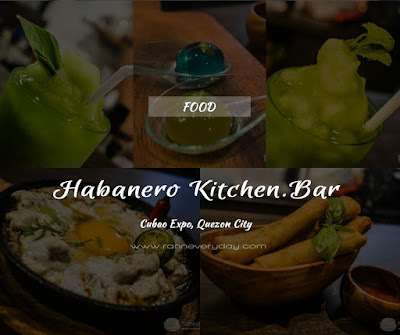 Disclaimer: Thank you so much to Sir Alvin Reyes of Cherry Credits PH for recommending us to the owners of Habanero Kitchen.Bar. 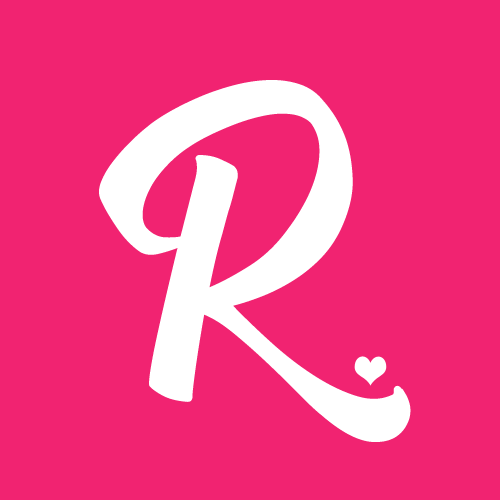 We also would like to say our warmest ccongratulations and thanks to the owners, Ryan Patrick Dimapilis and Pia Habalo Dimapilis.